Cal Ripken made too many All-Star teams, Keith Hernandez not enough. Cal Ripken Jr. was great. But he probably went to too many All-Star Games. Major League Baseball’s annual All-Star Game, which takes place Tuesday night in Miami, is supposed to be a celebration of the best ballplayers in the world collected in the same place for a few days a year. But it’s also a salute to fan favorites and other sentimental picks, even if the stats say they haven’t played up to snuff. This is to be expected, because the fans vote to determine the starting position players; the casual fan is less likely to be scrutinizing the BABIP of every National League shortstop than he or she is to just pick the person with the familiar name. So for every no-brainer All-Star like Barry Bonds in the early 2000s (or Mike Trout in more recent seasons), there have been starters like Cal Ripken Jr. in 2001 — a year he finished below the replacement level1 or Reggie Jackson (who’d hit .216 since the 1983 All-Star break) in 1984. But what would the All-Star Game look like if the stat geeks had full control over who played? Which players have consistently been voted into the All-Star Game despite weak stats? Are the rosters at least getting better over time? To judge who deserved to start the All-Star Game in a given year, I began with wins above replacement (WAR) data from FanGraphs.2 Since there’s something of a debate over whether the selection process should only consider first-half stats or a longer timeframe, I compromised by giving a player credit for both his first-half WAR from the season in question3 as well as his second-half WAR from the previous season, with the former getting double weight. (That way, more than half of a season is always considered, but emphasis is given to more recent performance.) I split this figure by position according to how many games the player spent at each spot on the diamond and ranked the players within each position for each league in each season. 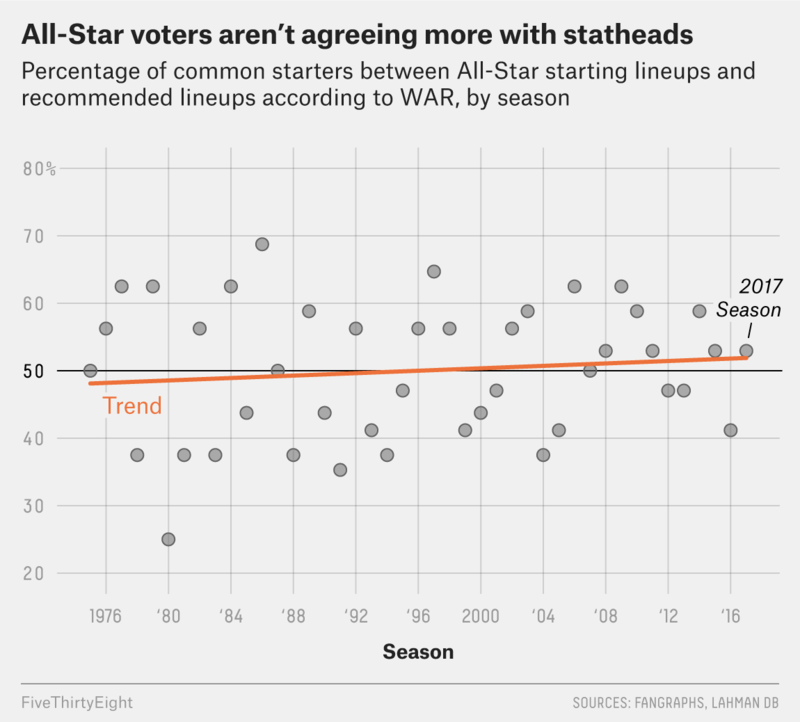 Who’s started too many (or too few) All-Star Games? Positional rankings are based on a blend of first-half WAR for the season in question and second-half WAR from the previous season. * Rodriguez shifted to 3B to make room for Ripken, displacing 3B WAR leader Troy Glaus. Ripken isn’t the only one, though. Some of the players received an overly generous haul of All-Star nods due to the scarcity of big names at their position. Hall of Fame catcher Ivan Rodriguez was an automatic pick for many All-Star voters for more than a decade, seldom having much competing star power to draw eyes away from his checkbox on the ballot (with all due respect to Jason Varitek and Jorge Posada). As a 35-year-old in 2007, Pudge — who was very much on the decline by that point — was still a more enticing pick for fans than Ramon Hernandez, Kenji Johjima and Gerald Laird, for obvious reasons. Meanwhile, the anti-Ripken is longtime Cardinals and Mets first baseman Keith Hernandez, who only started a single All-Star Game (1986) despite leading National League first basemen in WAR eight times. Four of those seasons, the slick-fielding Hernandez was thwarted by Steve Garvey, who — not coincidentally — is tied for third on the “over-selected” list above. He also lost out to Jack Clark, Al Oliver and even Pete Rose, who moved to first base (and was one of the league’s worst fielders there) late in his career. As for more current players, a mild modern version of Hernandez is Joey Votto, who was beaten out for this year’s NL first-base starting job by Ryan Zimmerman. Including this season, Votto has led the position in WAR four times, but he’s only been named a starter twice. (Meanwhile, today’s less extreme version of Ripken is catcher Salvador Perez, a four-time starter but a two-time WAR leader.) It is a bit harder to find players with huge gaps between reputation and performance these days, though, and you might think that’s due to the rise of sabermetrics in recent seasons. That doesn’t necessarily mean we’ll see somebody challenge Ripken’s (or Hernandez’s) records for misplaced All-Star voting anytime soon. But with the voters still foregoing the cold logic of statistics in favor of sentiment, it does mean there’s still a chance for it to happen, for better and for worse. Never mind that he homered on a grooved pitch from Chan Ho Park in the game. I usually blend FanGraphs’ version of WAR with that of Baseball-Reference.com, but only FanGraphs calculates monthly WAR splits. Defined as his WAR for the months of April through June. FanGraphs’ monthly WAR splits go back to 1974, but as noted above, I used the previous year’s second-half stats in my ranking.